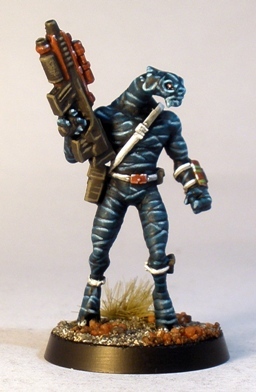 This cool looking alien tracker is the newest addition to my fledgling Tau Auxiliary force. Its an as yet unreleased model from CP Models sculpted by PF. I have been following PF sculpting a range of armoured sci-fi troopers via LAF for about a year or so. 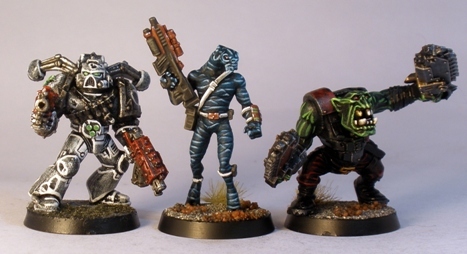 The sculpts really appealed to me and despite an unsuccessful attempt to get them produced via IndieGoGo, they are still going into production via CP Models: good news for all miniature enthusiasts of taste I think. PF sent me an early copy of two of the models: a “Nabh” Shocktrooper (unpainted as yet, but started) and this “Loor” scout. The Loor is the first finished. I considered adding some sort of skin markings: tattoos or maybe freckle like things on certain areas, but because of the interesting line markings on the hide of the alien, I figured it might get get too busy if I did – extra work and a potentially inferior end result – so I left it. Another slightly different shot to show the chin on these models: it blends with the background a little in the first shot. 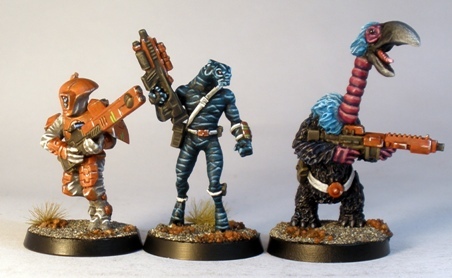 Like a few of my other alien miniatures, I decided to paint this guys equipment to match the Tau test piece that I did last year. 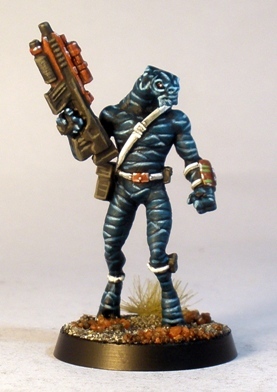 I am unsure when I will get to painting my Tau models – it could be next week or it might not be for a few years yet – but when I do I will hopefully have a few alien auxiliary miniatures like this guy painted in advance, ready to back them up. The scheme is intentionally relatively quick to apply in order to allow decent numbers of models to be produced without driving me crazy, so it wont win any prizes. Its easily plenty good enough for some gaming though, particularly when applied to such interesting figures.